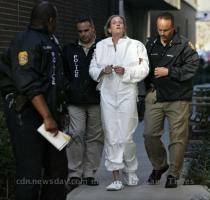 TAMPA (GaeaTimes.com)- Julie Powers Schenecker, the 50 year old mother who has been charged of killing her own children has been hospitalized. As per the latest reports, the Hillsborough County resident was admitted to the Tampa General Hospital shortly after midnight on Saturday where is undergoing a treatment for some medical condition that has not been publicly disclosed. Julie Powers Schenecker was arrested from her Tampa home on Friday morning after police reached the house to find the children dead and the mother at the back porch of the house smeared in blood. It was Julie Powers Schenecker’s mother who first called the police. Although the lady who resides in Texas was not aware of the actual conditions but informed the police that some unfortunate situation might have struck the family for she was not being able to get in touch with her daughter and grandchildren. She told police that her daughter had told her that she was fed up of the way the children used to behave with her. Tampa Police spokeswoman Laura McElroy divulged that Julie Powers Schenecker has confessed about the crime to them describing all of it in details. She however said that the explanation that the suspect gave not was enough. Julie Powers Schenecker has told that she murdered her 13 year old son Beau Powers Schenecker and 16 year old daughter Calyx Powers Schenecker because they had become too mouthy and misbehaved with her. Police said that they found Calyx Powers Schenecker lying dead inside her room while the brother was dead inside the car that was parked inside the garage. Julie Powers Schenecker had apparently written a note where she mentioned about the act before indulging in it.